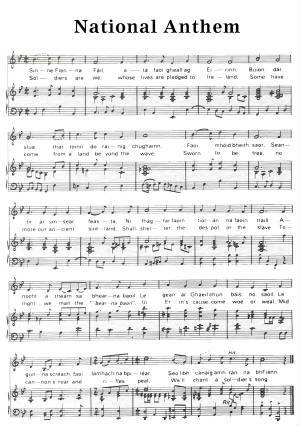 The Soldiers Song Abhran Na Bhfiann lyrics, chords and sheet music. Written by Peader Kearney and Paddy Heeney. No pirate blood shall nourish. IN 1907, Peadar Kearney, uncle of playwright and author Brendan Behan, wrote the lyrics of a song he called `The Soldier's Song' or Amhran,na bhFiann', and the music was composed by his friend and collaborator, Patrick Heaney. It was first published in 1912. The first line of the chorus read `Soldiers are we' in English and was translated into Irish as `Sinne Laochra Fail'. (Laoch—a hero, a champion, a warrior, a soldier; Dinneen). The song became popular when it was sung by the occupiers of the GPO in 1916 and in 1926 the song was adopted by the W T. Cosgrave led Government as the Irish National Anthem. In that same year Eamon de Valera founded a political party which he named Fianna Fail and the line `Sinne Laochra Fail' miraculously became `Sinne Fianna Fail'. It was a `stroke' of pure genius. But how was it done? Henceforth, every time the National Anthem would be sung his new party would get a priceless `plug' and it goes without saying that in the intervening years this has helped Fianna Fail immeasurably in gaining and holding on to power. But, when one considers that the new National Anthem was being hijacked by the very people who had tried so hard to destroy the State, it is difficult to understand why the Cosgrave Government did not put a loot on it right at the beginning. , then again, I suppose we must remember that at I hat time Mr Cosgrave and his colleagues were fully occupied with the almost impossible job of getting a new State up and running after the chaos and slaughter of the Civil War, while, just then, de Valera and his followers had lots of how on their hands. In August 1923, the first general election of the Irish free State, Eamon de Valera , decided once more to ignore the democratic voice of the people and refused to take his seat in Dail Eireann because of the oath of allegiance to the Crown It was not until August 1927 that De Valera led his deputies back to the chamber, now casually declaring the oath an empty formality . Eamon de Valera played no part in the formative years of the State, but it is on record that he spent the four years very profitably on business of his own; and it is goes without saying that he and his Irregulars did not boycott their Dail salaries during their extended vacation. 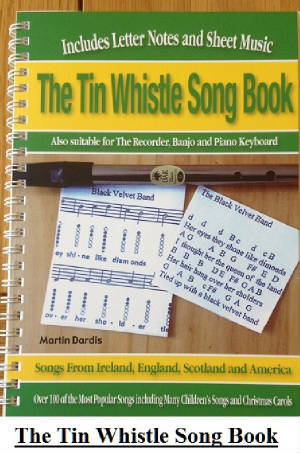 Is it time for the people of Ireland to reclaim their National Anthem from Fianna Fail and cleanse it from the taint of party politics ? Patrick Heaney wrote the music for The Soldiers Song, it was Peadar Kearney who asked him to put the music to his song. Heaney was born 19 Oct. 1881 in Tyrone Street Dublin which later became Railway Street. He played The Melodeon and worked for The Post Office. Paddy Heaney couldn't write music but had a good ear. He most likley wrote the notes down as ''abc'' notation and later got someone to transcribe it to sheet music. He died aged 30 and is buried in Drumcondra Dublin in a graveyard behind The Cat And Cage pub. It's an unmarked grave but theres a small plaque to remember Paddy at the entrance to the graveyard.